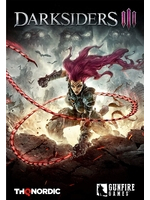 Karlstad, Sweden and Vienna, Austria, July 9, 2018 – THQ Nordic today announced that hack-n-slash action-adventure Darksiders® III, currently in development at Gunfire Games, is scheduled to release worldwide on November 27, 2018 for PC, PlayStation® 4 computer entertainment system and the Xbox® One family of devices, including the Xbox One X.
THQ Nordic has also launched a comprehensive pre-order campaign for Darksiders III, designed to reward a fanbase whose patience and loyalty is second to none. • Premium Box ~117cm - 46"
• Wall Scroll - Fabric print with hanger 77 x 100 - 30" x 40"
I feel like THQ Nordic is sending Darksiders 3 out to die. Almost no marketing, only 1 gameplay video that looked really bad, no presence at E3 2018 nor any new gameplay video, and now they're asking for pre-orders of a game of which almost nothing has been shown. Hard to feel confident this will turn out any good if even the publisher doesn't have confidence in it. It's not a triple-A Überhype game though. If they start their marketing a couple months before release and try to get people to pick it up more or less spontaniously then I think it could work out. There aren't many classic fantasy action-adventures anymore. I for one will definitely buy it. THQ seem to know what they're doing with these franchises. they seem to go for the "release quick remaster > gauge interest > release sequel with a fitting budget" and then move onto the next thing. seems to be working out for them so far. this won't have the budget or be looking for the sales of god of war so i'm sure it'll do ok. I understand it's not a AAA game or on the level of God of War (2018). But from everything showed in the first - and only - gameplay video, it seems to be even less ambitious and solid than the first 2 games. I get THQ Nordic's strategy, though I hate not knowing much of a game mere months away. Specially when I've seen a lot more of many games 2-3 years from release, which is also bad, but at least you know what those games are. I say this as I'm in the minority that actually enjoyed the Darksiders games - Darksiders 1 more than Darksiders 2, because the loot system in Darksiders 2 was very bloated and overwhelming. I remember having to manage all the loot I got every 10-20 minutes, which gets annoying in a 40 hours game. 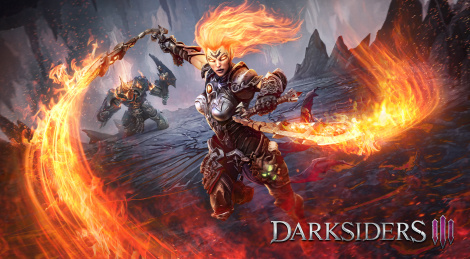 Still, I hope Darksiders 3 is a very good game and that it sells very well, I actually want to see a Darksiders 4 and hopefully a Darksiders 5 in the future. Which if Darksiders 3 fails both critically and commercially, I don't believe anyone will bother with the franchise anymore. I'm not sure they'll do ok with this game. I didn't even remember that it was once anounced. And think most people don't remember that this game was still in development. That’s what marketing is for. They have 5 months to remind people.